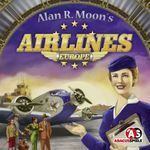 • Abacusspiele employee Matthias Wagner has posted an Airlines Europe geeklist that records the path of this Alan R. Moon game design from prototype to production. Lots of fun details in this write-up, as long as you don't mind seeing how the sausage gets made. 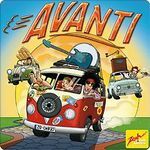 • In other Abacusspiele news, the publisher has posted rules on its site in four languages – German, English, French and Italian – for its early 2011 releases: Airlines Europe, Gold!, and its new version of Tichu. • Rules for Serge Laget's Cargo Noir, coming from Days of Wonder, are also available in English, French and German. • Stefan Brück at alea announced on the alea forum that rules for Stefan Feld's Die Burgen von Burgund will be posted on the alea site within a week. • On Feb. 15, 2011, following NY Toy Fair, Mayfair Games will visit the gaming retail mecca known as The Compleat Strategist and other spots in NYC to give away four-day passes to Gen Con 2011. Details on the Mayfair Games website. • Designer Andrew Looney has revealed that a new brand of Fluxx is in the works: Star Fluxx. Nothing more than a name and the obligatory spaceship at this point. • Alderac Entertainment Group is offering free Thunderstone promo packs, with only 4,000 sets being available. (Additional packs cost $2, plus shipping.) Four thousand sounds like a huge amount given that BGG lists only 3,400-ish owners of the game, but believe it or not not every gamer visits BGG. It's true! • The new version of Eric B. Vogel's Cambria from Closet Nerd Games has a March 2011 release date. • TricTrac.net has posted a first look at the next title from Ystari Games, due out March 2011: Philippe Keyaerts' Olympos. Who knew Zeus was that buff? Yowza! • Portal Publishing is releasing a new version of the 2003 card game Zombiaki in February 2011, a version that will be compatible with Zombiaki II: Attack on Moscow. • In other Portal news, solo rules are available for Ignacy Trzewiczek's 51st State, but only in Polish as far as I can tell. (BGG user ethidium has translated the solo rules to English.) 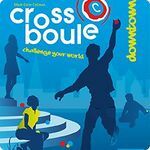 To tie into the release of these rules, Portal is holding a contest in which players are challenged to score 125 points or more. The first player to do so wins Trzewiczek's Prêt-à-Porter and the forthcoming 51st State expansion, due out in late 2011. 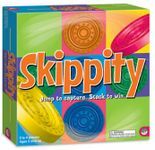 If Susan McKinley Ross' Qwirkle can be described as a simplified Scrabble – with colors and shapes replacing letters – then her 2010 release from MindWare – Skippity – might be dubbed "checkers for the Timothy Leary set". In 2010, Mayfair Games announced the formation of an imprint titled FunFair that would release family-friendly games, such as Tom McMurchie's Tsuro, which was released in a new edition in 2009 from Calliope Games – the company that Mayfair absorbed and remade into FunFair. Seize and capture your friends' pawns in this delightful game with two unique ways to play! Surround yourself with friends and family and get ready to enjoy two great games that hold more fun than any four walls can contain! So! Many! Exclamation! Points! 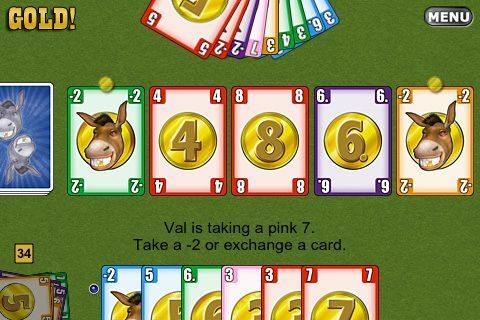 A bit more detail: In the "Bright" version of Got 'Em, players have a hand of three cards that tell you where you can place a wall, how far you can move your pawn and whether you have the ability to remove or pass through a wall already on the board. 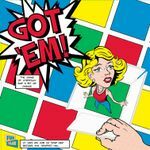 Got 'Em is for 2-6 players, ages 10 and up, with a 15-30 minute playing time. The game retails for $30 and has a street date of May 19, 2011. 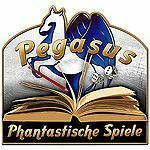 After many recent difficult productions, it's nice to have an easy one for a change – and that's what happened with my new board game Mondo, which will appear from Pegasus Spiele in German and Z-Man Games in English. After a movie wraps, the director does press tours praising the actors and vice versa. I'd like to take this opportunity to do the same, but not just to be polite. This time the game started with a visual idea: an empty playing area that would be covered with matching tiles. This "key visual," as you say in advertising, is an image of the globe, which is depicted on the game board of each player. This defines where you can legally place your tiles, which means that the most important rules are already given to players from the start. Game play takes place simultaneously, with everyone drawing from the same stock of landscape tiles. You earn positive points for animals collected and landscapes completed, while losing points for mistakes or an abundance of volcanoes. A timer determines how long you have to arrange and place the most valuable combination of tiles. Beginners have seven minutes available to them, and while that might sound like a lot, it's not. If you do manage to finish early though, you can score extra points while the other players continue until time runs out. The advanced and professional game settings, as well as multiple variants, provide increased thrills and a lot of variety. This last feature was already clear during development, namely that the game system is incredibly flexible. Elaborating on these possibilities was a central goal for me. Over the past two months I haven't posted much game news due to the Boardgame News implosion of 2010, but that doesn't mean I've been goofing off completely. Mostly goofing off, yes, but not full-bodied, 100% loafing. 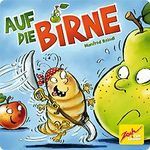 • German manufacturer Scheer Spiele GmbH & Co. KG failed to deliver a number of game titles to publishers on the eve of the Spiel 2010 game convention last October, with Queen Games being especially hard hit. 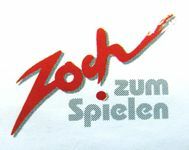 In January 2011 in its 50th year of business, Scheer – manufacturer of Spiel des Jahres-winning titles like Carcassonne, El Grande and The Settlers of Catan – filed for insolvency, according to the Main Post. The article notes that financial irregularities in early 2010 led to a financial loss "in the high six figures". • Michael Schacht was interviewed in English by Jeux'n'Co. One forthcoming title he mentioned, Mondo, will be featured in a designer diary from Schacht this coming Monday, Jan. 31. • In other Schacht news, his card game Gold! 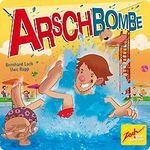 will debut on February 3, 2011 from German publisher Abacusspiele to coincide with the opening of the Nürnberg Toy and Game Fair. On that same date, a digital version of Gold! will debut from Skotos Tech for iDevices. For a detailed summary of game play, head to the Gold! page and check out my game description. • Mayfair Games is holding weekly giveaways of Catanimals – plush versions of the building components in The Settlers of Catan – on its Facebook page. To enter, you must visit this photo album on the Tuesday that a new image is posted and "like" that image. One random "liker" will be chosen as the winner. 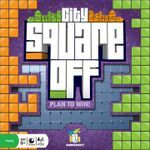 I am pleased to announce that my latest game, City Square Off, will be published by Gamewright in April 2011. I am extremely excited both about this game and about working with Gamewright again! How did this game come about? Let's turn the clock way back, all the way to 2004/2005 when I had three different game designs in progress that all used the same basic pieces: One game was about roller coaster parks, another about metropolitan development, and the third an economic bidding game. Funny thing, though, City Square Off was not one of those three games! To create all of those shapes, I had used graph paper to design them, then cut them out. As best as I can remember, one afternoon I was working on the roller coaster game, in which players acquired various rides of different shapes and built them into a theme park with lakes and forests. I was working on the building rules and how players needed to maintain paths to various rides. 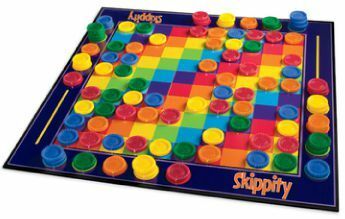 While trying to determine the rules and the size of the board, the idea for City Square Off just hit me. I immediately made up a prototype and began to playtest the design, realizing quickly that I had come up with a very elegant tile-placement game. BGG News will publish game announcements, industry news, previews of upcoming games, game design diaries from the designers themselves, and interviews with folks from around the game world. 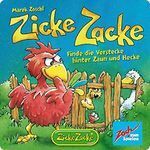 (For the past several weeks, I've been posting info about forthcoming games in a Nürnberg 2011 geeklist; check it out if you haven't seen it already!) Guest authors will pop up from time to time with articles that merit your attention, and I'll post link round-ups for other game-related posts to check out should you feel like venturing away from the cozy confines of BGG. BGG News should feel familiar to those who have been on BGG for a while. The comment system is the same; you can thumb, tip or flag posts; you can subscribe to future posts through BGG's internal subscription system or through RSS; an author's avatar is visible on each post, so you can check out that person's profile or contact him or her privately. Gone Cardboard – BGN's list of forthcoming and recently released titles – will reappear on BGG down the road. Integrating Gone Cardboard with BGG involves more trickery and work than what I did on BGN, but thankfully people far more experienced with site design than me will be figuring out how to make everything function. In other words, when Gone Cardboard does reappear, it will work as intended! Designer diaries, game previews and other articles previously published on Boardgame News – whether on the first or second version of that site – will be republished in BGG News in the future, making that material available once again. Finally, if you want to contribute to BGG News – whether as a designer or publisher with info to share or a design story to tell, as a reporter or researcher who wants to cover particular companies or game genres, or as a ne'er-do-well who, um, never does well – contact me via email (wericmartin @ gmail . com) or through BGG. I want to hear from you, as do BGG readers, who want to stay on top of all that's coming in this great hobby of ours. I'll do my best to keep you informed, and I hope you'll keep reading! 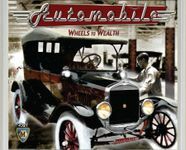 Mayfair Games has announced that its version of Martin Wallace's Automobile – first released by Wallace's own Warfrog Games through its Treefrog imprint – has finally arrived in house and will soon begin shipping to North American distributors. Automobile has a February 17, 2011 street date in North America, so don't expect to see it on store shelves before then.